The Secret to getting anything you want in three easy steps. Focus all your effort to achieving goal. Choosing goals aligned to your Why. Finding accountability partners, support groups, and mentors to guide you. Hiring a coach to fill your gaps, and teach you best practices. Talking (and complaining) less and doing more. Choose one action that will lead to your goals. 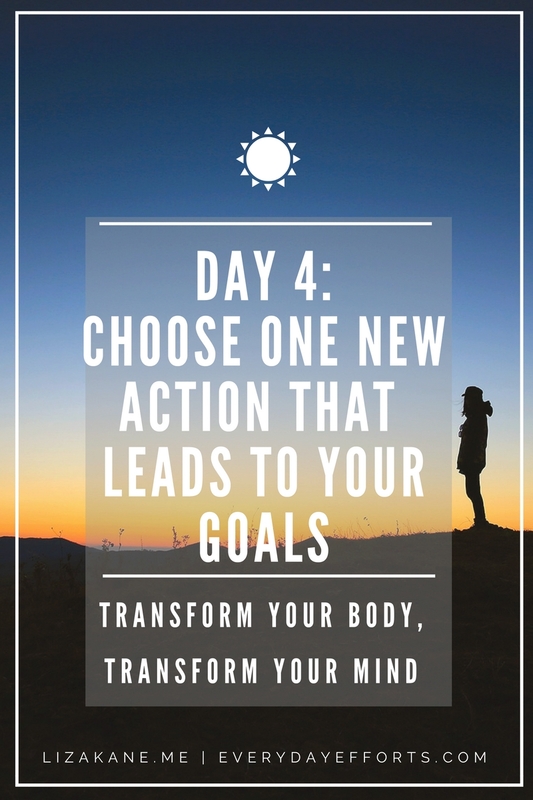 We’re on Day 4 of the 7-Day Transform Your Body, Transform Your Mind Challenge. How exciting to be past halfway! Hopefully you’re gaining some good insights so far, and that you’re starting this year more focused than ever! 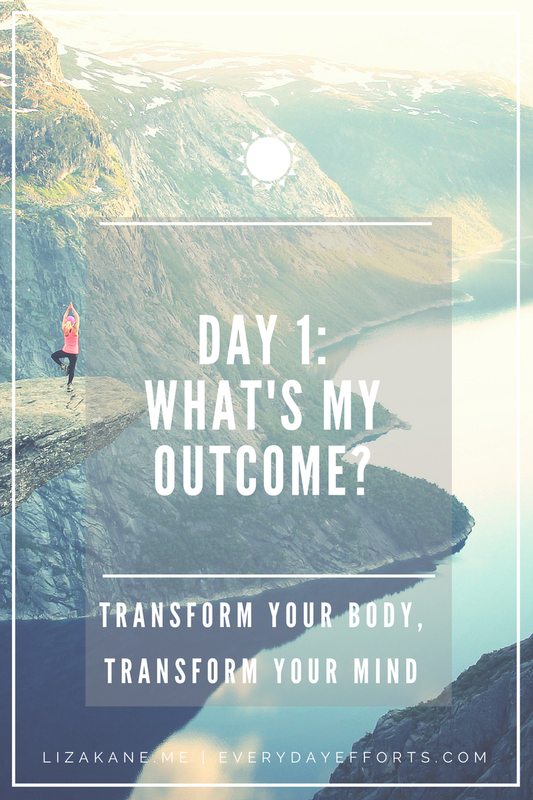 For a recap, we have gone over the one question that has become our filter for processing the stuff that life throws our way: “What is my Outcome?” So, whether you’re trying to plan your day or your week or a new project, ask yourself that question. Then, follow it up with “Why?” Why is this important? Does this align with my core values? Is this the best way to spend my time? Then, we went over creating a MAP (Massive Action Plan) rather than multiple to-do lists in order to feel in control. And yesterday, we talked about clarifying your priorities in order to create meaningful goals that are aligned with your highest values. 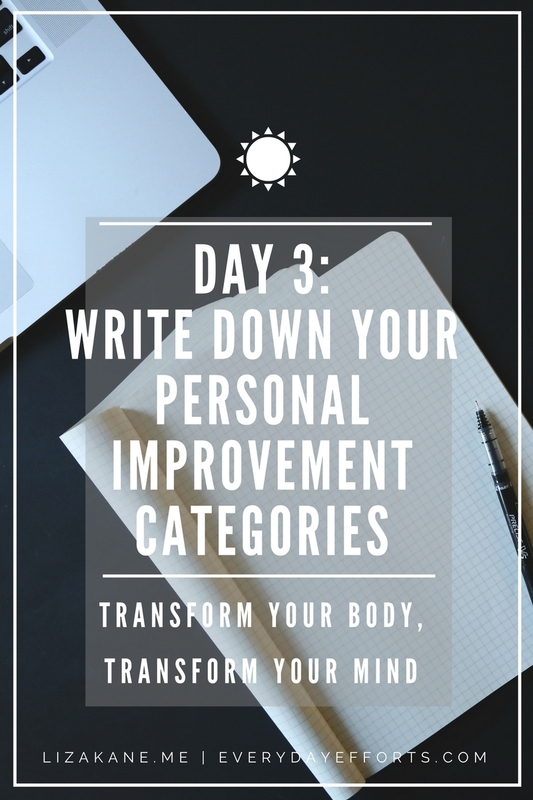 Today, we’re going to zoom out a little bit and talk about the importance of daily habits and choosing a new action that will lead you to your goals. 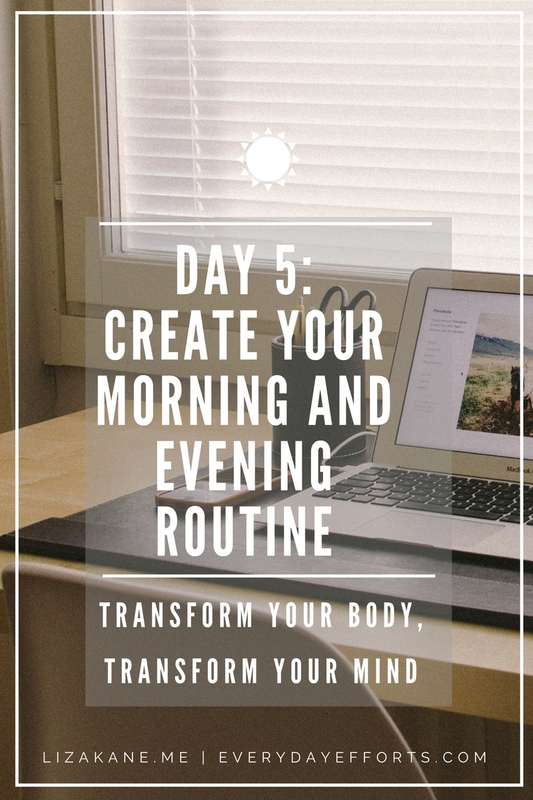 I waited until Day 4 to talk about routines because most people are too overwhelmed to receive the importance of daily habits and routines from the start. They either dismiss it as being unimportant or they want to do it but doubt they can commit. By starting with the end in mind though, and asking ourselves “What is the Outcome I want?” we are in a more receptive mindset to accept what we want in life and what we need to do to get there. This is also the main reason we focus on our Why. Our Why determines our How. It also gives us the fuel to accomplish the tasks to get our Outcome. The goal of creating routines is to set yourself up with consistent behaviors that will ultimately become a habit. Habit is basically a pattern of actions or behaviors that is so ingrained that it’s automatic. 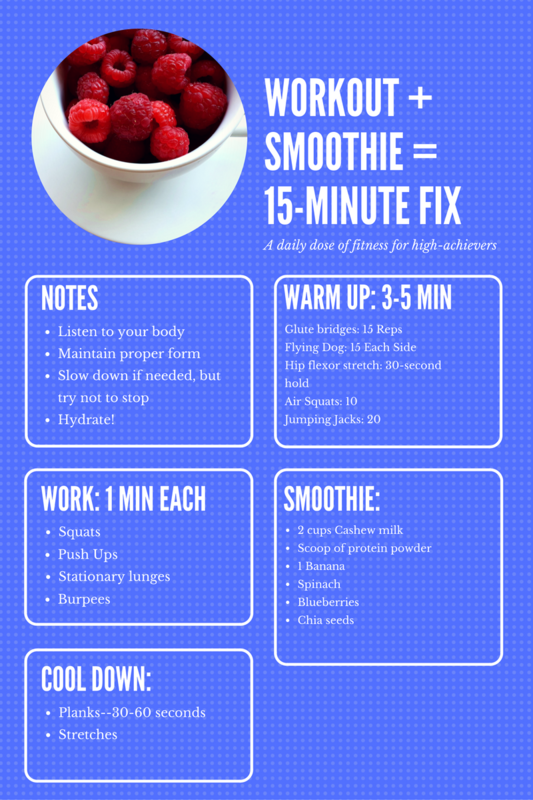 For the most part, you don’t have to think about brushing your teeth, or eating a meal. It’s this autopilot mode that we’re going for. In order to create a routine that will be meaningful to us, we must first review our current routine. Examine how you start and end your typical day. Take just one day from the past week as an example, or a mash up of days. How many activities actually link back to the priorities that you listed from yesterday? How much time is wasted on diversions or distractions? How often were you blindsided, and needed to put out urgent fires? Just like yesterday, this isn’t about guilt. This is about taking a true measure of where we are at now to see what we need to do to get to our ideal day. When do you wake up? What tasks or projects get done and when? When do you spend time with your family, friends, or significant others? When do you practice self-care? When do you fall asleep? Now compare the two days. If you’re feeling good about how they line up, then kudos! However, if they don’t align, see where the gaps are, and ask yourself what you need to do to bridge that gap. From there, you should be able to glean one new action that you can focus on. For example, if you want to read 3 books a week, and know that you can read about 100 pages in 1 hour, you would need around 1-2 hours a day to reach that goal. From there, you can schedule in times to read. You could read during your morning coffee time. Or, grab audiobooks to listen to on your commute or while you’re doing house chores. The key is being aware that a gap exists, and being able to see what actions are needed in order to make it happen. If you decide that this task fits your Why, schedule it into your day. Whatever you decide, choose one new action that will get you the most impact on your ideal day. Change doesn’t have to be all or nothing. In fact it’s best to build up incorporating newness into your life. Think about it: all things are difficult at first before they become easy. You don’t become an expert immediately. So don’t set yourself up for defeat by taking on too much, making you feel like a failure. Choose one new action to get you started, and then build more from there. Create cues around your new action to make it easier to follow. Ideally, it should be around habits you already do naturally. For example, if you automatically grab coffee in the morning, think about doing your new workout routine right after it. Or, maybe you could sleep in your workout clothes. If you write, you could make it a point to sit at your computer right after you grab your coffee. Whatever your new action is, tie it together to a habit that’s already unconscious for you. Celebrate the action itself. If your goal is to write a novel and you want to write 4 pages every morning, make sure you celebrate showing up even if you didn’t get your 4 pages. The action that you want to cultivate is showing up. Whether you actually wrote anything, or exercised, or made any sort of progress is irrelevant at this point. You’re trying to create new actions for your brain to get used to. Action is more important than emotions at this stage. The more you show up, you are already creating that ideal life you dream of having. For any new habit, I highly recommend you do it first thing in the morning. Ideally, within the first hour of your day. Remember how we were talking about habits being automatic actions? New actions are something we need to consciously follow, and thus requires a little extra effort from us to follow. However, when we are tired and not feeling it, new or conscious actions are one of the first things we drop. Our willpower is just like any muscle: it’ll tire with too many stressors or choices throughout the day. So, unless you have a strong cue that will lead into your new action (like always stopping by the gym after work), try to set up your new habit in the mornings. Tomorrow we’ll get into more details about morning and evening routines, but for now, it’s your turn! Get cracking on identifying where your gaps are and choosing one new action to add to your day. I hope you get a lot of insight from where you spend your time and how you structure your day, and that you’re one step closer to living your ideal day, every day. 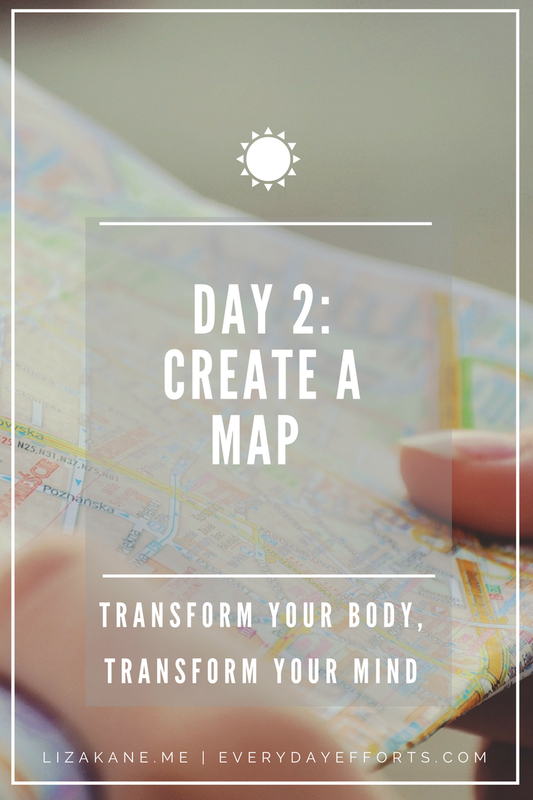 Welcome to the first day of the 7-Day “Transform Your Body, Transform Your Mind” Challenge! I’m happy you’re here with me! New Year’s Day is the perfect day to tackle something new and life-changing. The air is filled with such hope and optimism, it’s like free energy and motivation. So, let’s ride the euphoria with a little dreaming and goal-setting! Today, we’ll focus on the very first step of really productive, life-changing, stick-to-it goals: Outcome. It may sound strange to start with the last step, but without knowing your target, you will waste time, energy, and precious motivation on tasks that get you nowhere. Most people have a love-hate relationship with goals, especially New Year’s resolutions. They love the idea of them, but hate making them because they know, deep down or otherwise, that nothing will really change. There’s a feeling of newness and universality when it comes to goals this time of year, and it’s easy to be swept away by the outpouring of goal-setting. “I want to lose weight” is a common enough goal, but what does that even mean? Will you lose fat? Will you lose a limb? Legs are heavy, right? And what if you gain muscle? Muscle weighs more than fat, will you feel bad about gaining muscle weight? “I want to be healthy” is also a common goal, but what does healthy mean? What does healthy look like? I know that we’ve heard or said other goals that were similarly vague. It’s no wonder that New Year’s Resolutions have a 90% failure rate. There’s no way you’d be set up for success with goals like that. The problem is, that most goals don’t stick because they were made randomly or superficially, usually on the heels of hearing another person’s goal or resolution. And, they were made knowing full well that they weren’t going to be kept. What’s worse: we usually make the goals because honestly? We really, really, really want to make those positive changes in our lives. When we make goals just to make them, it’s like we’re throwing spaghetti on the wall, wondering if anything will stick. Begin with the end in mind. The best way to find goals that stick, would be to think about the outcome you want. The more specific and detailed you can be, the better. I mean, you should be able to see, feel, hear, smell what your outcome will be. For example, if you want to lose weight, you need to know what you want to look and feel like. You’ll need to think about what it takes to achieve and maintain that weight. You’ll need to envision what your new everyday will look like. Write this all out on a piece of paper. Draw it out if you have the inclination. Find your Why. Then, after you know the outcome you seek, you’ll need to find your reason. Why did you choose this outcome. Dig deep. The more it resonates with your core values the better. Why do you want this goal? Why now? Write it out as detailed as you can. The more real your language, the more it sounds like you, the better! Use those visceral, gritty, juicy, delicious words that will excite you and get you going. I think it’s clear that the second one has a more relevant Why that speaks to me in my language. The more your Why resonates with your values, the more you can focus on your goal. Your Why will also dictate How you will achieve your goals. With a deeper emotional connection, the idea of “What should I do?” will start to take care of itself. With a big enough Why, your How will fall in place. The more you ask yourself this question every day for any project or goal that comes your way, the more productive you will become in things that matter most to you. If you wanted to follow along with my daily workouts, I’ve attached tomorrow’s workout below! 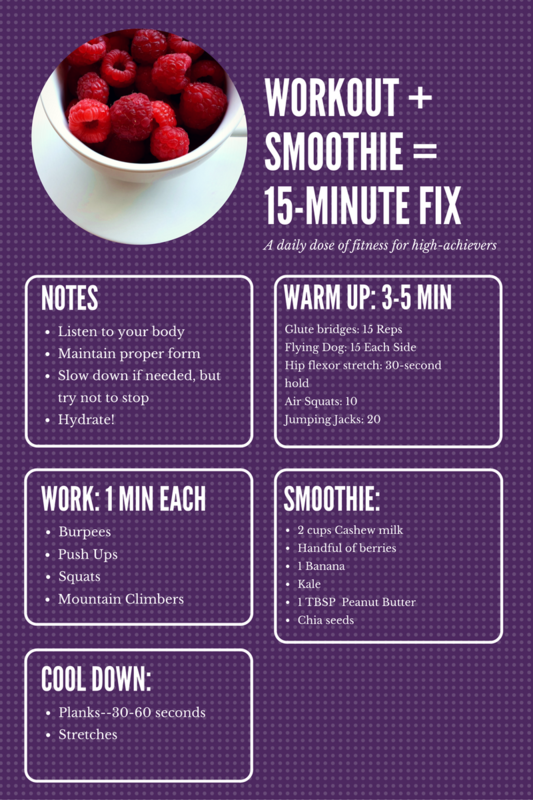 I chose to do body weight exercises for this week so that you will have no excuses to start right away! 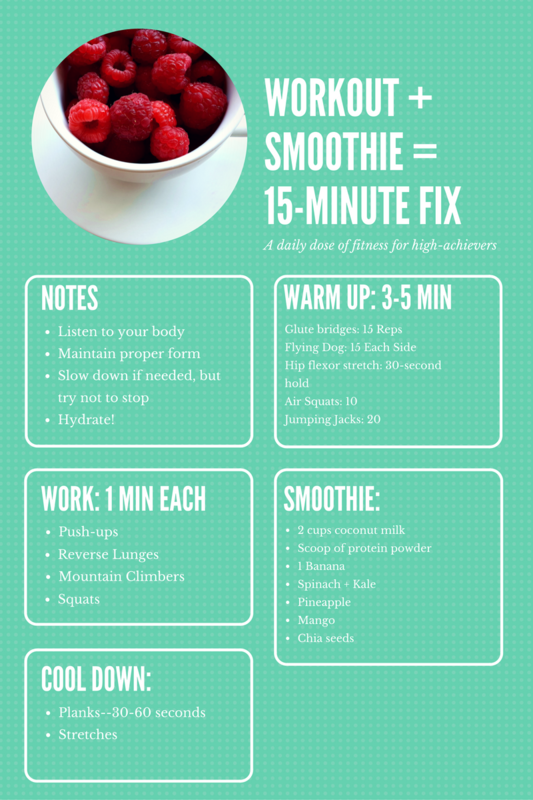 From warm up to smoothie, this should take about 15 minutes!